Photos of Soup coming Soon! We made this soup last night and it's out of this world. The soup was taken out of a book called "How to Cook Everything Vegetarian" by Mark Bittman, my sister gave this book to me as a gift and I love it! When Neo was a puppy I caught him chewing on the corner of it, so I have puppy bite marks on my book, I was mad at the time but now they just add to the sentimental value of the book. This soup has a very small amount of ingredients, so it's great for those on a budget. It also taste greats reheated so it's perfect to make a large amount of it and put it in small single serving containers to take to work for lunches. This is also great for those on a diet as it is very filling, and the hot pepper is known to speed up the metabolism. This soup is made Italian style. This is how many people cook vegetables in Italy, a technique that can then turn the vegetable into a soup or sauce in a second. This soup is Vegan but can be made vegetarian by adding hard cooked eggs, a sheep's milk cheese like pecorino Romano or Parmesan, maybe even adding a good mozzarella cheese might also taste good. Put about half the oil in a saucepan over medium heat. When hot, add the onion and cook, stirring occasionally, until it softens and just begins to brown, about 10 minutes. Stir in the garlic, red pepper, cauliflower, a pinch of salt and black pepper and continue to cook, stirring, until the cauliflower glistens, 3 to 5 minutes. Add the stock and stir. Bring to a boil over high heat, then adjust the heat so the mixture simmers. 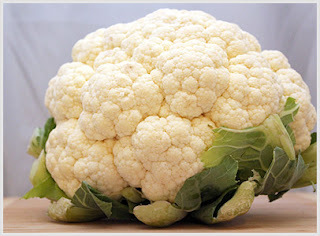 Cook until the cauliflower is tender but not falling apart, 10-15 minutes. Taste and adjust the seasoning, then stir in the remaining oil. I added more salt and pepper to my dish only my honey loved it just the way it was. Serve this immediately, over croutons. I will post my recipe for homemade croutons soon because they are way better than any store bought, and they add to the flavor of the dish. Enjoy your Happy Healthy Dish! thanks a lot, i know now what to prepare when my friend visits... she would be amazed and love this soup.. thanks a lot and more power.. I will surely give that try.It is nice and easy recipe.